Estradiol (E2), a highly lipophilic molecule with good oral absorption but poor oral bioavailability, was incorporated into poly(lactide-co-glycolide) (PLGA) nanoparticles to improve its oral bioavailability. Nanoparticles were prepared by using polyvinyl alcohol (PVA) or didodecyldimethylammonium bromide (DMAB) as stabilizer, leading to negatively (size 410.9 ± 39.4 nm) and positively (size 148.3 ± 10.7 nm) charged particles, respectively. Both preparations showed near zero order release in vitro with about 95% drug being released within 45 and 31 days for PVA and DMAB, respectively. In situ intestinal uptake studies in male Sprague–Dawley (SD) rats showed higher uptake of DMAB stabilized nanoparticles. Following oral administration to male SD rats, E2 could be detected in blood for 7 and 2 days from DMAB and PVA stabilized nanoparticles, respectively. Histopathological examination and blood counts indicated the absence of inflammatory response. 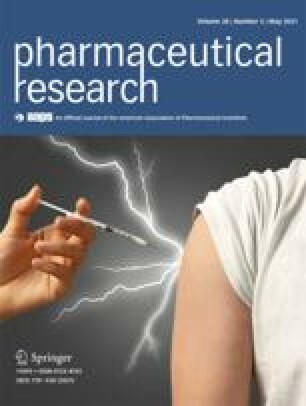 These data suggest that DMAB stabilized PLGA nanoparticles have great potential as carriers for oral delivery of estradiol. I.B. and S.H. acknowledge NIPER Fellowships in 2003–2005. V.B. is grateful to NIPER for providing PhD Fellowship. Start-up fund from NIPER, Research grants from Royal Society of Chemistry (RSC), London, UK; Third World Academy of Science (TWAS), Italy, and Department of Science and Technology (DST), India, to M.N.V.R.K. are gratefully acknowledged. We take this opportunity to extend our sincere thanks to Orion Pharma (Finland) and Boehringer Ingelheim (Germany) for providing Estradiol and PLGA as gift samples, respectively. Thanks are due to Rahul and Dinesh for providing the technical assistance to this project.